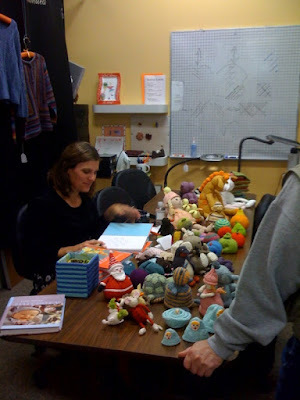 I've been lucky enough to attend 2 book signings in Minneapolis. First was the release party for One Yard Wonders which was co-written by the owner of Crafty Planet. The launch party was quite fun and there was a huge turn-out! The book is really cute and there are several of the 101 projects that I have my eye on. Now that I've had a chance to page through Itty Bitty Toys I'm excited to get started on several projects. The reversible Frog/Turtle toy is at the top of the list after seeing it last week. For those of you that are not familiar with Susan's work, she wrote Itty Bitty Hats and Itty Bitty Nursery (I've blogged about quite a few of her patterns). Now back to the grind - I've got 5 days to finish all my handmade Christmas gifts for the family. It's going to be a real nail-bitter to see if I make it (especially since I have to fit in the midnight showing of New Moon Thursday night!!!! ).